Take Action! Comments from the public on the recently issued draft recovery plan are being accepted until August 29. You have an opportunity to influence this process. Send in your comment today! A guide explaining how canis lupus baileyi became one of the most endangered mammals in North America—and how it can be saved from extinction. Is there anything I can do to help? Yes! What is a Mexican gray wolf, and how is it different from a gray wolf? Mexican wolf on the Sevilleta National Wildlife Refuge, New Mexico. Download image. 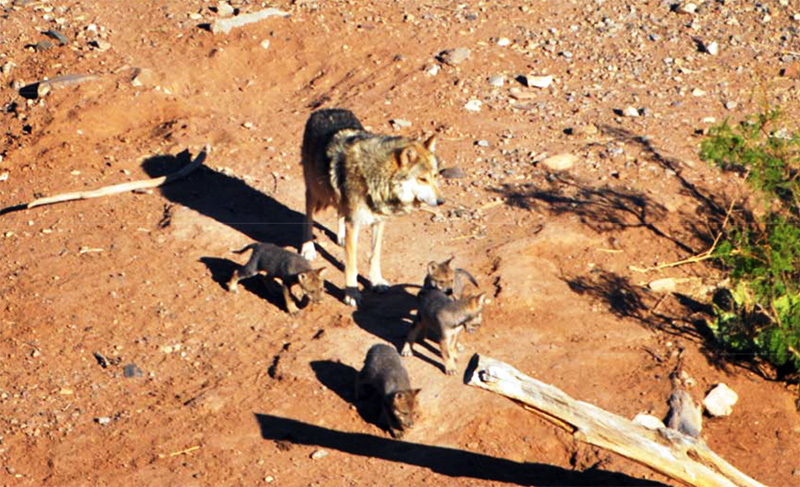 Mexican wolf pack howling at Sevilleta Wolf Management Facility. Download image. Mexican wolf pup. Download image. The Mexican gray wolf (Canis lupus baileyi)—the “lobo” of Southwestern lore—is the most genetically distinct lineage of wolves in the Western Hemisphere. At only 25–32 inches tall, the Mexican gray wolf is smaller than its cousin, the gray wolf (Canis lupus) of the northern Rocky Mountains and the Pacific Northwest. Mexican gray wolves have historically lived across the southwest of the U.S. and Mexico. They have a distinctive, richly colored coat of buff, gray, rust, and black, and they often have distinguishing facial patterns. Like their cousins, Mexican wolves live in packs with a complex social structure and an intricate communication system. 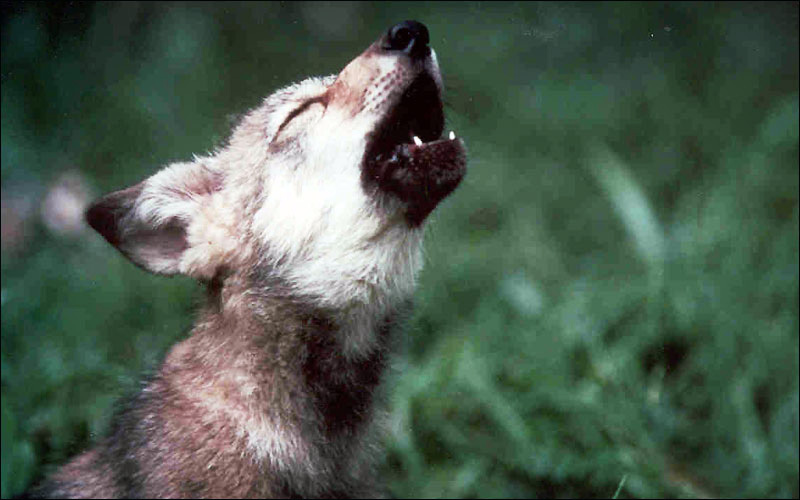 Their howl is an iconic symbol of the West. How many Mexican gray wolves exist in the wild today? Mexican gray wolves once numbered in the thousands throughout the southwestern U.S. and Mexico, but with the arrival of the livestock industry, ranchers and government agents nearly silenced this important predator with rifles, traps, and poisons. Now there is only a single Mexican gray wolf population that lives in the mountains of central Arizona and New Mexico. As of the most recent count in February 2017, the sole wild Mexican gray wolf population had only 113 wolves, making it one of the most endangered mammals in North America. Why is the Mexican gray wolf population still so small? In 1976, the U.S. Fish and Wildlife Service lists the Mexican gray wolf as endangered after a federal program exterminated all but seven lobos. In 1982, the service issues a placeholder “recovery plan,” a legally required blueprint for the restoration of federally endangered species. In 1998, a small population of captive-born lobos all descendants of the surviving seven is released into the Blue Range Wilderness on the New Mexico-Arizona border. The service controversially designates the lobos a nonessential experimental population, which allows for the “take”—shooting, trapping, capture, or harm—of wolves in the wild. In 1995, 2003, and 2012, under pressure from state hunting and livestock interests, the service abandons three separate attempts to replace the temporary 1982 document with a final plan. The wild population languishes. The slow release of captive lobos, poaching, and other human-caused deaths impede the population’s growth. In 2009, fewer than 50 wolves and only two breeding pairs are left in the wild. In 2014, Earthjustice sues the service for its more than 30-year delay to develop a valid recovery plan. In May 2016, Earthjustice reaches an agreement that the service must finalize a plan by November 2017. In November 2017, a final recovery plan is due. But will it be based on science or be influenced by those opposed to the recovery of the lobos in the American southwest? State governors announce opposition to wolf recovery despite a population of about only 100 wolves in the wild. A court grants New Mexico a temporary ban on further release of Mexican gray wolves. The Mexican gray wolves were all but eliminated from the wild in the U.S. by the early 1970s, and the U.S. 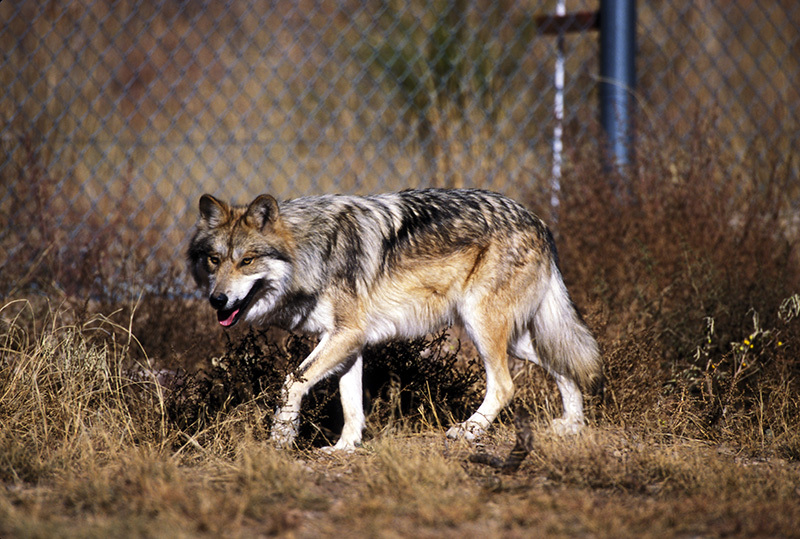 Fish and Wildlife Service listed the Mexican gray wolf as endangered in 1976. By 1980, the wolves were heading toward extinction in Mexico as well, and between 1977 and 1980 the U.S. Fish and Wildlife Service and its Mexican counterpart captured the last known Mexican gray wolves in the wild. These last survivors of the wild population became the founders of a captive-breeding program designed to increase and enhance the population’s genetic diversity and prevent the wolves’ extinction. 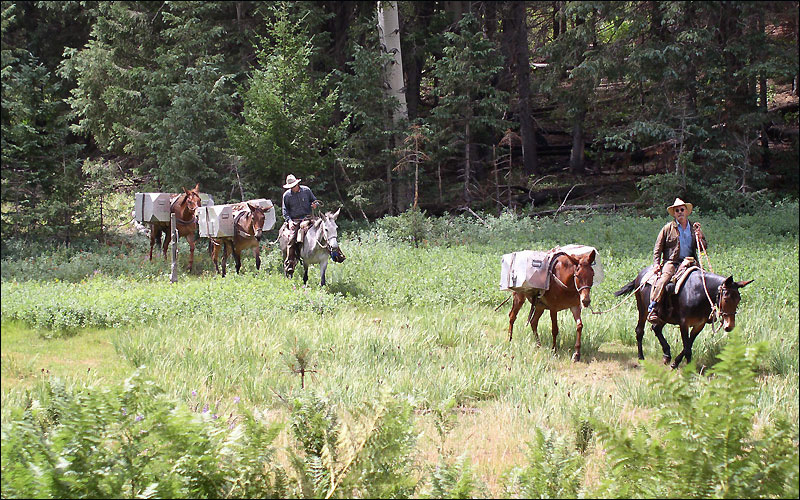 Aspen Pack, 2005 translocation. Download image. In 1998, the service reintroduced a small population into the wild made up of members that were bred from just seven captive wolves from this program. 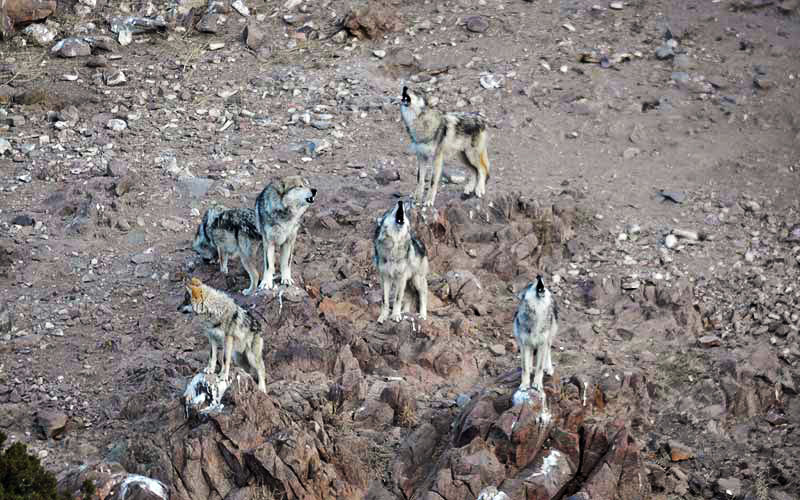 Every wild lobo that exists today is a descendent of those seven wolves. Today, the wild population remains on the brink of extinction, threatened by both illegal and legal killings. Last year’s population count found that escalating mortalities and illegal killing, along with reduced pup survival, reduced the wild population by 11 percent from the previous year. But there’s more to the story than just the numbers: the population’s poor genetic diversity may be the biggest threat facing the wolves. To remedy this, the service must release more wolves into the wild. However, the long-overdue Recovery Plan, issued on Nov. 29, 2017, does not provide for sufficient releases of wolves into the wild and fails to ensure conservation and enhancement of genetic diversity to ameliorate inbreeding. Why is it bad if these wolves go extinct? There is an ethical and moral dimension to the loss of an entire species due to human impact. Also, the loss of a top predator can have cataclysmic impact on the health of the entire ecosystem. This was witnessed in Yellowstone after the extirpation of wolves in the Rocky Mountains in the early 20th century. Dark Canyon Pack, July 31, 2014. Download image. The loss of the linchpin predator disrupted food webs and set off a phenomenon called a “trophic cascade,” in which the wolves’ natural prey (in this case, elk) multiplied and consumed unsustainable amounts of native vegetation. When wolves were returned to the park, they kept the elk population in check and changed the prey’s behavior. The herbivores started to avoid riparian areas in valleys and gorges where they could be easily hunted by predators. As a result, these ecologically important areas began to regenerate and species such as birds, beavers, mice, and bears returned. 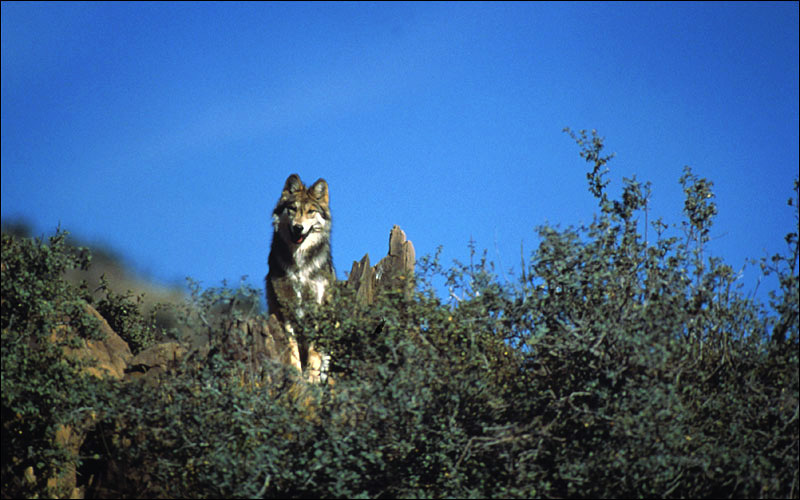 Many believe that the return of the lobo’s population to healthy levels would have a similar beneficial impact on the ecosystem of the Southwest. What specifically does the Endangered Species Act require? The Endangered Species Act is one of the most popular and important environmental laws. Among other things, it requires the Fish and Wildlife Service to “conserve” all listed species to the point that they no longer need the protection of the Act; in other words, the service must “recover” the species in the wild. It also requires the service to develop recovery plans based on the best available science that provide a blueprint with strategies and benchmarks that ensure the species achieve recovery. Once listed, species may not be killed or harassed, and in most cases, their habitats must be protected. What protections does the Mexican gray wolf have now under the Endangered Species Act? M636 at Sevilleta Wolf Management Facility. Download image. This means that Fish and Wildlife Service may manage the wolf under relaxed rules that allow wolf "take"—killing, harassing, or damaging habitat necessary for the survival and recovery of the species—that is usually barred by the law. The service did this because it believed—wrongly, as demonstrated by the significant amount of illegal wolf killings—that this approach would cause opponents to accept the wolf. 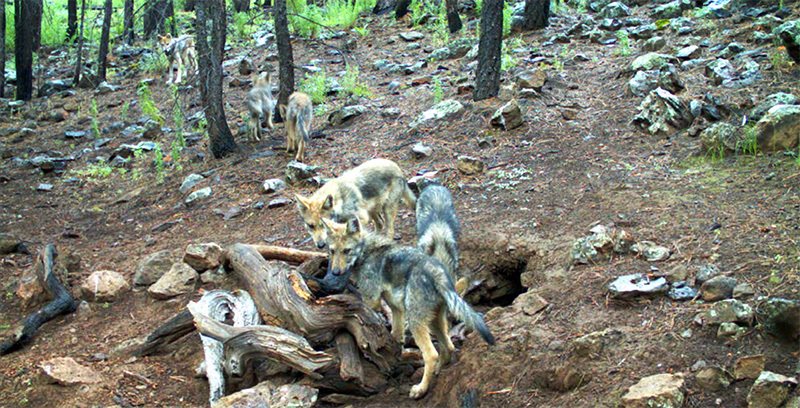 The service released the most recent rule governing Mexican gray wolf management in January 2015, and Earthjustice challenged it due to major flaws that would handicap the wolves’ chances for recovery. These flaws include limiting the wolves to a single population of just 300–325 individuals, preventing them from roaming broadly into necessary recovery habitat, and allowing for excessive killing of wolves at the behest of ranching or hunting interests. It’s been 40 years since Fish and Wildlife Service listed the Mexican gray wolf as federally endangered. Why hasn’t the lobo recovered? The lobo continues to struggle for survival because the Fish and Wildlife Service has for decades bowed to intense political pressure from state fish and game agencies whose hunting constituents perceive the wolf as an unwelcome competitor for deer and elk. The politically powerful ranching industry has also pressured the service to not adopt conservation measures like reintroducing more wolves into the wild that would benefit the wolves and increase their chances for recovery. F511 at Sevilleta Wolf Management Facility. Download image. As a result, the service’s track record on restoring this iconic animal to the wild under the Endangered Species Act has been marred by years of delay and false starts, leaving the wolf on the brink of collapse four decades after it was listed as endangered. One of the seminal obstacles to wolf recovery is the service’s failure to develop a valid recovery plan. Such a plan, which is mandatory under the Endangered Species Act, is essentially a blueprint for rebuilding an endangered species’ population to sustainable levels, and it is critical to ensure the lobos’ survival. A successful lawsuit, brought by Earthjustice on behalf of our clients, resulted in a court settlement that forced the service to prepare a long-delayed recovery plan for Mexican gray wolves. Unfortunately, the Recovery Plan, issued on Nov. 29, is riddled with shortcomings that will hinder—if not outright prevent—Mexican wolf recovery. What does a valid recovery plan provide? A recovery plan outlines specific conservation strategies, timelines, and benchmarks that the Fish and Wildlife Service will achieve in order to recover the species. The plan is based on the best available science. What happened after the court settlement in 2016 regarding a recovery plan? In the settlement agreement, the service was required to complete a recovery plan by November 30, 2017, that includes a peer review by respected experts and mandatory periodic status reports so we can keep track of progress and identify any emerging issues. The long-overdue recovery plan was issued on Nov. 29. Will it save the lobos? The agency refused to listen to the tens of thousands of people who asked them to fix the flawed draft plan before finalizing it. Among the people who weighed in asking for stronger protections for the wolves were concerned citizens, business owners and scientists. Without a scientifically grounded recovery plan, there exists the very real possibility that this majestic species will go extinct. What does the Mexican gray wolf need in order to rebound to a healthy population? The service’s most recent recovery team of wolf experts has done extensive, rigorous work to determine what needs to be done to save the subspecies. Their work to date amounts to the best available science on the wolves’ recovery needs. M1051 with four pups. Download image. The team concluded that survival required the establishment of wolves in at least three populations located in the current area of occupation in the mountains of central Arizona and New Mexico, and also in the Grand Canyon region and in the southern Rockies of southern Colorado. Despite these recommendations, the Recovery Plan relies excessively on Mexico for recovery, even though that region lacks appropriate habitat for the wolves. Expert scientists have called the current wild population a “genetic basket case in need of serious genetic rehab. Failing to do so is irresponsible and also managing for extinction.” The service must act without delay to complete a scientifically sound recovery plan and management rule that will ensure the wolves’ survival. Where is suitable habitat for the Mexican gray wolf located? 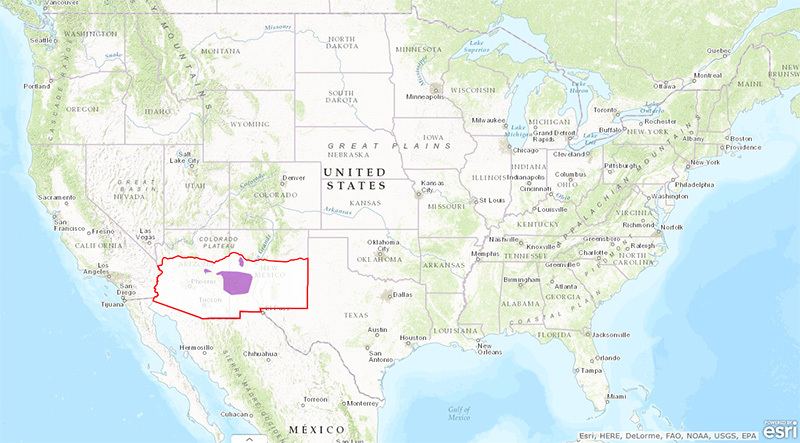 Habitat capable of supporting the two additional populations needed for Mexican gray wolf recovery exists in the Grand Canyon ecoregion and in northern New Mexico/southern Colorado. 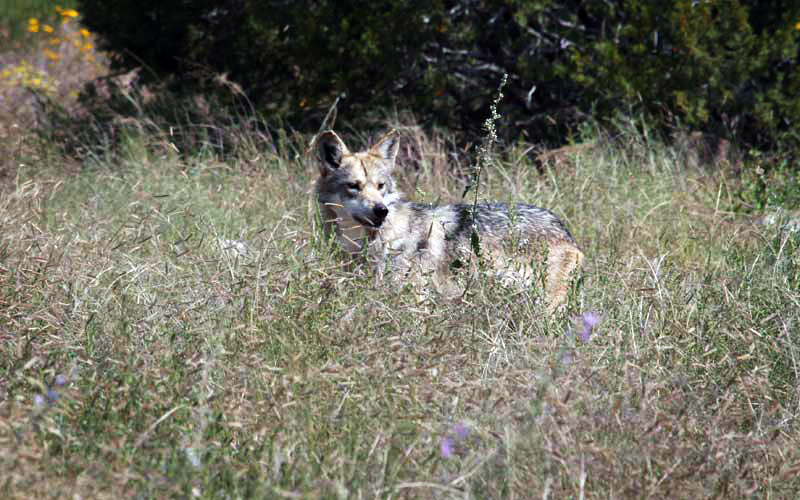 The service’s most recent recovery team drafted a plan in 2012 that called for establishing three interconnected Mexican gray wolf populations totaling at least 750 animals in these areas, but the service abruptly abandoned the planning process before a plan could be finalized. But these wolves were never historically in Colorado. Why should they be allowed there now? Scientists have found that Mexican gray wolves lived in Mexico, Arizona, New Mexico, and west Texas before roaming as far north as Colorado where they intergraded with other wolf subspecies. However, wolf recovery efforts are not limited by the boundaries of its historic habitat; the Endangered Species Act requires recovery of the species in the wild and does not limit recovery to historic habitat. Climate change means historic habitat may no longer support recovery and the ranges of many species may shift northward. Do these wolves kill livestock? Occasionally. Native prey for Mexican gray wolves includes elk, mule deer, white-tailed deer, javelina, rabbits, and other small mammals. Mexican wolves can and do occasionally kill livestock, particularly young animals, though the overall number of livestock killed by Mexican wolves is small. A report found that in 2012, when there were 75 wolves in the designated recovery area, wolf depredation accounted for just 0.1% of all the cattle in that area. Mexican wolves also readily scavenge on carcasses of prey species. What about deer and elk? Arizona Game and Fish says there has been no discernible impact on deer or elk populations since Mexican gray wolves were released in wild. 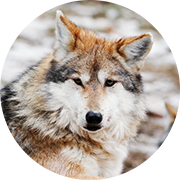 What is Earthjustice doing to help the Mexican gray wolf? Forcing the Service to Complete the Long-overdue Recovery Plan: The first, filed on behalf of Defenders of Wildlife, the Center for Biological Diversity, the Endangered Wolf Center, the Wolf Conservation Center, and retired Mexican Wolf Recovery Coordinator David R. Parsons, is a challenge to the Fish and Wildlife Service’s failure to produce a valid recovery plan for the wolf. Earthjustice attorneys negotiated a settlement agreement that requires the service to complete the required recovery plan by Nov. 30, 2017. On Nov. 29, 2017, the Recovery Plan was released. However, the plan charts a course for extinction rather than recovery, cutting off wolf access to vital recovery habitat and failing to respond to mounting genetic threats to the species. “It’s a ‘recovery plan’ in name only. Without additional habitat and greater genetic diversity, the wolves will continue to teeter on the brink of extinction. The plan provides none of these essential needs,” said Heidi McIntosh, managing attorney at Earthjustice. Challenging the Fatally Flawed Mexican Wolf Plan: On Jan. 30, Earthjustice—on behalf of the Center for Biological Diversity, Defenders of Wildlife, retired Fish and Wildlife Service Mexican Wolf Recovery Coordinator David R. Parsons, the Endangered Wolf Center and the Wolf Conservation Center—filed a lawsuit challenging the deeply flawed recovery plan. The plaintiffs are asking a federal judge to order the government to develop a Mexican wolf recovery plan that legitimately responds to recovery needs for the species as the law requires. 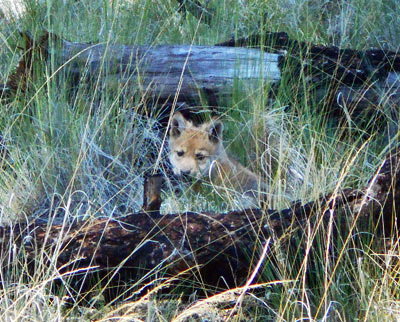 One of five pups in the Iron Creek Pack observed during June, 2015. This pup is about 7 weeks old. Download image. Getting an Effective Rule to Manage Wolves on an Ongoing Basis: In the second case, Earthjustice, on behalf of Center for Biological Diversity and Defenders of Wildlife, is challenging provisions of the federal government’s rule governing the service’s management of Mexican gray wolves. The federal rule the service published in early 2015 makes some positive changes, including increasing the range of the species, but it also has some poison pill provisions that will ultimately doom any chance of survival of the wolf. Earthjustice is challenging these flawed aspects of the rule including an arbitrary cap on the number of wolves allowed in a specified management area, limits on the areas in which the wolf will be allowed to roam, and the permission for wolves to be killed in unjustifiable circumstances and with insufficient oversight. This case is being briefed. The recently issued Draft Recovery Plan is available for public comment only until August 29, 2017. Send your comment today. The Fish and Wildlife Service and the Department of Interior needs to hear that you support a recovery plan that is based on sound science and that ensures the survival of Mexican gray wolves in the wild. By informing the FWS of where the “recovery” plan falls short, we can encourage the agency to improve the plan and ensure that this species will not fade into extinction. Tell the Department of the Interior and the Fish and Wildlife Service to save the Mexican gray wolf from extinction. The draft recovery plan that they produced will not be enough to save this species! The governors of Arizona, New Mexico, Utah and Colorado, bowing to pressure from ranchers and anti-wolf interests, are fighting to undermine recovery efforts. Political pressure should not interfere with a science-based recovery plan. The Endangered Species Act has a proven record of success in protecting wildlife in danger of extinction. It has helped to prevent the extinction of the American bald eagle, Florida manatee, and California condor—as well as thousands of other plants, fish and animals. The Act has prevented more than 99% of listed species from going extinct.